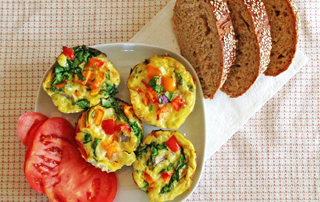 Want to have some quick, healthy breakfast muffins on hand? We’ve got just the solution for busy families who want to eat right but have very little time in the morning — plus we recommend 3 nontoxic kitchen tools to make and store your muffins. Do this 5 Minute Veggie Egg Muffin Recipe on a moment’s notice — or even in advance the night before. Literally, it takes 5 minutes to whip up a batch and put them in the oven. There’s very little mess. Set the timer on your smart phone while you do something else, and voila! There it is! Bonus Tip! Pack them in the refrigerator for a few days and pull them out in a rush, heat up, and serve in an instant with some fresh fruit or tomatoes and whole grain bread. 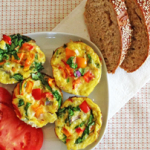 The protein punch will get you through until lunch, and the veggies will fill you up with lots of nutrients. Keep scrolling for the 5-minute breakfast solution! You need eggs and veggies. 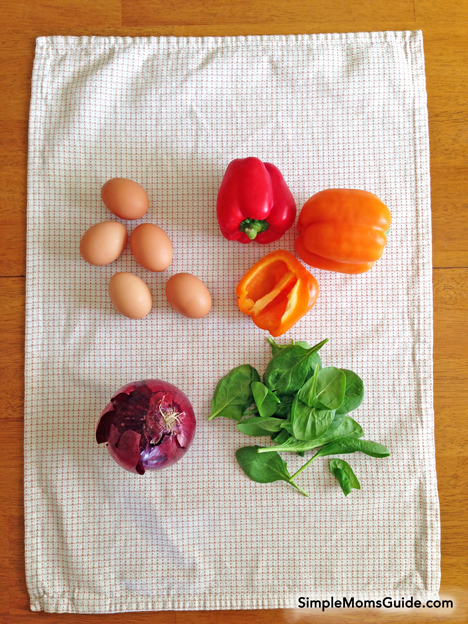 We’ve got here some organic eggs, orange and red bell peppers, red onion, and organic spinach. 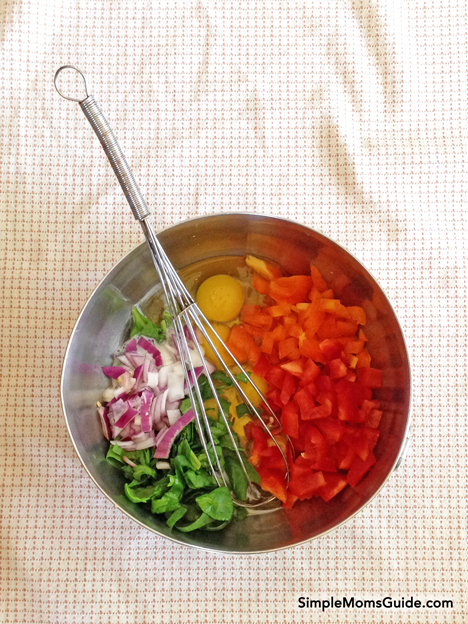 Avoid the really watery veggies like tomatoes because they will change your recipe consistency and will mess up the baking — too much liquid. We’ve got five eggs in here with all the veggies chopped up, plus a dash of milk, salt, and pepper. You could also put in some garlic power if you like. If you have cilantro on hand, that would be great too. Make it your own with your own family’s tastes. Whip it all up and pour into greased muffin pans — just 3/4 full, please (because as the muffins cook they expand up). We used a stainless steel muffin tin with olive oil spray. Heat up your oven to 350°F. Bake for 20-30 minutes — check at 20 minutes to see if the center is cooked with a toothpick (or just eyeball it!). 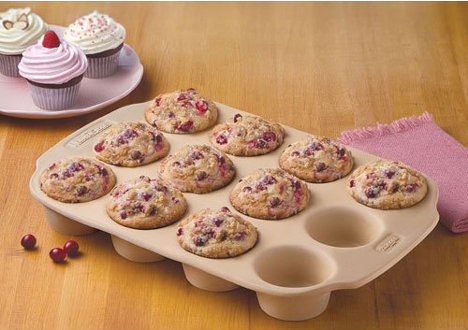 Keep scrolling — we have some great muffin pan options for you that are non-toxic! And here you go! 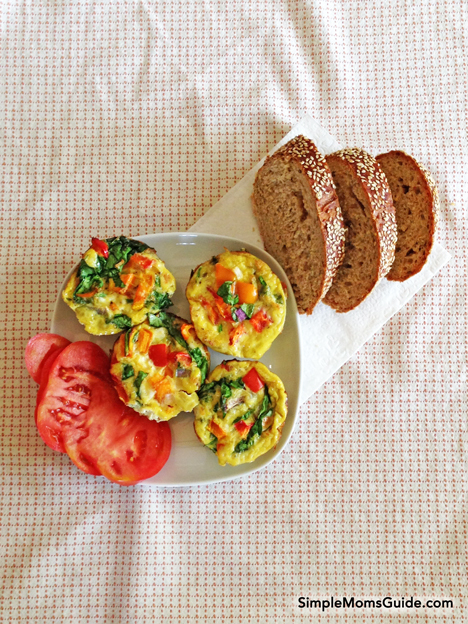 This batch made us about 7 veggie egg muffins with this recipe. We ate some right away – yum!!!! And put the rest in the fridge in our non-toxic, see-thru Pyrex glass storage container. Need some non-toxic muffin tins for your kitchen? Look below for great ideas! 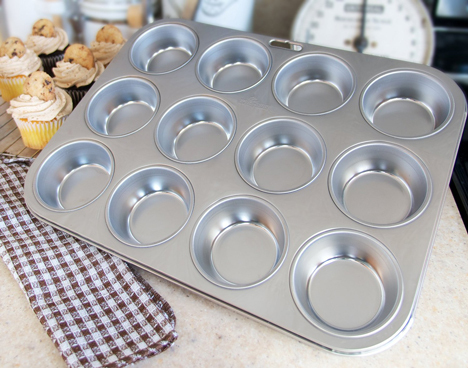 This is a beautiful, long-lasting muffin tin made of non-toxic stainless steel that is sure to last years and years. A great addition to your kitchen. This stoneware piece is not only non-toxic and functional but also ever so pretty! Don’t you just love the color and the natural look? Your friends will be asking you where you got it. Have fun!